Civil Ceremony, as the Italian Law says, can be officiated exclusively inside the Town hall, as it is not possible to bring the Wedding registry book outside. Most Town halls are placed in magnificent Medieval or Renaissance Palaces which will leave you and your guests breathless for their beauty. There are some exceptions, and in some places, it is possible to set up the Ceremony outside. Feel free to contact us for further information. 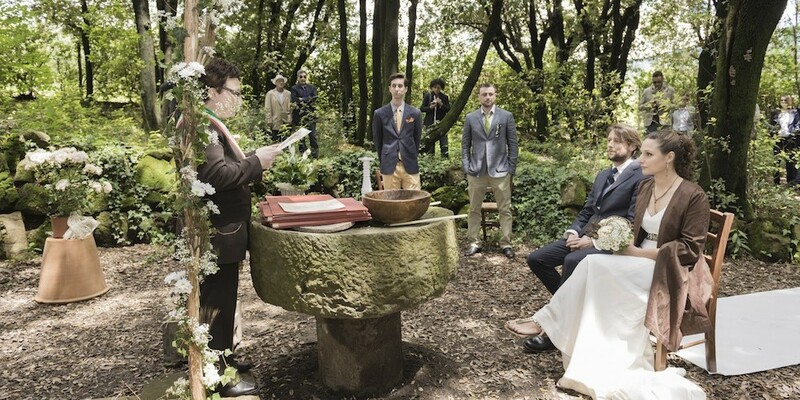 The Civil Ceremony consists in the reading of the articles 143, 144 and 147 out of the Italian Civil Code, the ritual Formula and answers of the Spouses, the exchange of the Rings (which is not compulsory), the Signing and a brief greeting speech made by the authority that officiated the Ceremony. The duration of the whole event is usually around 20 minutes, and the spouses can decide to customise it through Readings, Poems and Music selection. The ceremony is held in Italian but Italian Wedding Designer will provide an interpreter to translate everything for you and your guests. Two witnesses are legally needed. The couples who decide to celebrate their Civil ceremony in Italy will have to prepare all the documents needed, according to their nationality, and show up 2-3 days before the wedding to the Town hall where the wedding will take place, together with the interpreter to sign the Declaration of Intent, an original paper that declares that there is no impediment of any kind to their marriage in accordance with Italian Articles of the Civil Code. Contact us if you want to learn more about this process.